Warren Donovan (top) eliminators Ted Gilman (bottom) during the first round of Street Class Eliminates on 8/4/17. Gales Ferry, CT (August 4, 2017) – Week three of Fast Lane Fridays saw big changes in point standings as two of the class point leaders would miss the event allowing for new racers to take the place at the top. Adam Lewis would continue his win streak of winning a Street Class Eliminator since opening night. Jon Tisdale would grab top honors in the Bike Class and the special Import vs Domestic Shootout and Warren Wright would capture his second Outlaw Class win of the 2017 season. 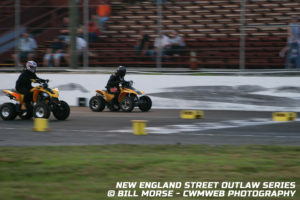 The Outlaw Class would get underway without incoming points leader and previous event winner Joe Fogarasi in the field. Allowing the class to make up the point gap the Outlaw Finals would see opening night winner Warren Wright paired against long time racer Tom Bischoff. A sputter out of Bischoffs 1932 Bantam was enough for Wright to grab his second win of the year from the left lane. The win would move Wright to the top of the point standings battle by just one point over Joe Fogarasi. After being Eliminated in the first round, first set of eliminators on July 21st Adam Lewis has yet to lose in the Street Class Eliminator rounds in 2017. His 2014 GMC has out lasted the competition and August 4th was no different. The final round would see Lewis paired up against Heidi Bradham would was entering her third final round eliminator in just four events. Lewis would come out on top again in the finals by running a close 2.91 run on a 2.89 dial in. The win would also hand the point lead to Lewis, now 18 points over second place Bradham. Drama and action was found in the Bike Class as well tonight. Coming into the event Jenna Barba was tied atop the point standings with Nathan Booth. Barba missing tonight’s action would see Booth needing to survive the hard charges of Jon Tisdale to keep his reign alone at the top. The Final Round would pair Tisdale against veteran Ron Hoyle who was racing his snowmobile. In what turned out to be a close run, Tisdale would capture top honors with a run of 3.132 on a 3.13 dial in, one of the closest runs of the season thus far. The win wasn’t enough to knock Booth off the top of the point standings. Booth now has a nine point lead over Tisdale and ten point lead over Barba. The final event of the night was the Import vs Domestic Shootout where all classes were combined into two categories, Imports and Domestics. As the field of cars and bikes grew smaller the final round would see Jon Tisdale on his import bike racing against John Sugure in his 1957 Chevy Wagon. The old Detroit muscle wasn’t enough as Tisdale put down a solid run and would out last all other racers to claim victory in the shootout. For complete eliminator round results and 2017 point standings please visit NEStreetOutlaws.com. No points were awarded for the Pro Tree Elimination sets. Next on the schedule will be Grudge Fest as Fast Lane Fridays, Friday August 11th that will feature Outlaw, Street and Bike Classes PLUS special Grudge Matches. Pits, Car Cruise Show and Grandstands open at 6pm, Test & Tune will start at 6:30 with opening ceremonies and eliminators to follow. Final round of Test & Tune as competitors make final adjustments before heading into the pit area. Gales Ferry, CT (July 28, 2017) – Three regular eliminators for Outlaw, Street and Bike were on the schedule card however with a low front wheel drive car count officials opted to remove the FWD vs RWD from the racing card and replace it with three Pro Tree eliminators for all classes. In total six eliminators were run with Fogarasi, Lewis and Tisdale winning regular rounds and Sugrue, Viscione and Tavares taking top honors in Pro Tree eliminators. The first set of Outlaw Finals would see opening night winner Joe Fogarasi paired against Charles Cirrito. A quick start on the light would allow Fogarasi to run down Cirrito at the line and grab his second win in three starts. The Pro Tree Outlaw Finals played host to veteran racer John Sugrue paired against Joe Fogarasi who has been no stranger to final round appearances in 2017. Unfortunalty a Fogarasi would have his transmission break following his semi-final round win and was unable to run Sugrue. The DNS would hand the victory to Sugrue without a final round being run. The first Street Class Eliminator Finals would have last weeks winner Adam Lewis running against former Street Class Champion Matt Viscione making his first start of 2017. While both racers would have solid reaction time at the line, Viscione would break out by running a 3.16 on a 3.18 dial-in. The break out would hand the win to Lewis who would run a 2.93 with a 2.91 dial-in. The Pro Tree Street Class Eliminator Finals would again feature Matt Viscione making the finals paired against opening night winner Keith Brown. Another break out would determine the winner of this final round, however it was Brown this time running a 2.92 on a 2.93 dial-on. The win by Viscione further extends his streak of at least one win every season since he began back in 2012. The largest class of the night was the Bike Class and their first set of Eliminators saw long time bike drag racer Jon Tisdale would be matched up against Nathan Booth. With a margin of victory of about one-foot Tisdale would bring home his first trophy of the 2017 season. Booth making the final round has him tied atop the point standings with Jenna Barba. The Pro Tree Bike Class Eliminator would see another familiar face in Jon Tisdale being paired against NESOS Rookie of the Year contender Ben Travares. Even with years of experience Tisdale would push the limit a little to far with a red light of -.015 seconds giving Travares his first career win at Fast Lane Fridays. For complete eliminator round results and 2017 point standings please visit NEStreetOutlaws.com. No points were awarded for the Pro Tree Elimination sets. Next on the schedule will be Fast Lane Fridays, Friday August 4th that will feature Outlaw, Street and Bike Classes PLUS a special Import vs Domestic Shootout where all classes will be combined into one large eliminator to see who will be the last one standing. Friday, July 14 @ 12:05pm – Due to current weather forecasts calling for on and off again showers for the remainder of the day, we have cancelled Fast Lane Fridays Import vs Domestic Night 1 for Friday, July 14th. We have moved the postponed 6/30 Eliminator 1 to Friday, July 21st. Bike Night on Friday, July 21st will now feature Double Eliminators for all classes + an additional Bike Class Shootout. All start times will move ahead 30 minutes for 7/21. Pits 5:30pm, Test & Tune 6pm, Intermission approx 7:30pm, Opening ceremonies at 8pm with Elimination Rounds to follow. Unfortunately, we regret to inform our Fast Lane Friday racers that for the second week in a row rain has won. After speaking with the New London-Waterford Speedbowl crew it will take approx. 6 hours to pump out the track after the rain stops. The front straight is currently under water. We will try again next Friday, 7/14 for our first Import vs Domestic Night. Thank you. NESOS Management. 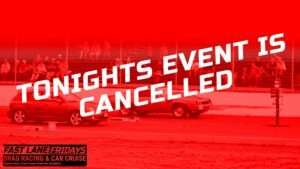 2017 Event Policy – In the event of weather delays/cancellations/postponements or other situations that allow an event to not finish PRIOR to the initial first elimination run of the night then that event is NOT official and you may save your wristband for entry to another 2017 Fast Lane Fridays event. Following the initial first elimination run of the night where the initial first two cars take times then that event becomes OFFICIAL and any postponement or delays will not be honored with that nights wristbands for future events. Those events may be made up or finished at a later date however new entry for that event is required. This policy may be changed by series officials as necessary for special situations. YOU MUST HAVE YOUR WRISTBAND FOR RE-ENTRY FOR FUTURE EVENTS, NO EXCEPTIONS WILL BE MADE!! Sunday 7/2 1pm – Please note we have updated our 2017 Fast Lane Fridays event schedule. Make-up Eliminators from 6/30 have been moved to 7/7 and 8/25. Your wristband from 6/30 is valid for re-entry to any 2017 Fast Lane Fridays event, you MUST provide your wristband for re-entry. Only racers who qualified or attempted to qualify for the 6/30 eliminators may race in the make up events. Friday 6/30 10pm – Well the weather won tonight. We want to thank everyone who came out tonight to our first almost event. Our rain check policy is in place. Please save your wristband they are good for any 2017 Fast Lane Friday events. We will announce tomorrow the makeup dates for tonight’s two elimination rounds that were never competed. Thank you again from the entire NESOS Team. Gales Ferry, CT (June 22, 2017) – On Friday, June 30th when racers pull into the New London-Waterford Speedbowl for the opening night they will see added incentives and bonus money up for grabs. 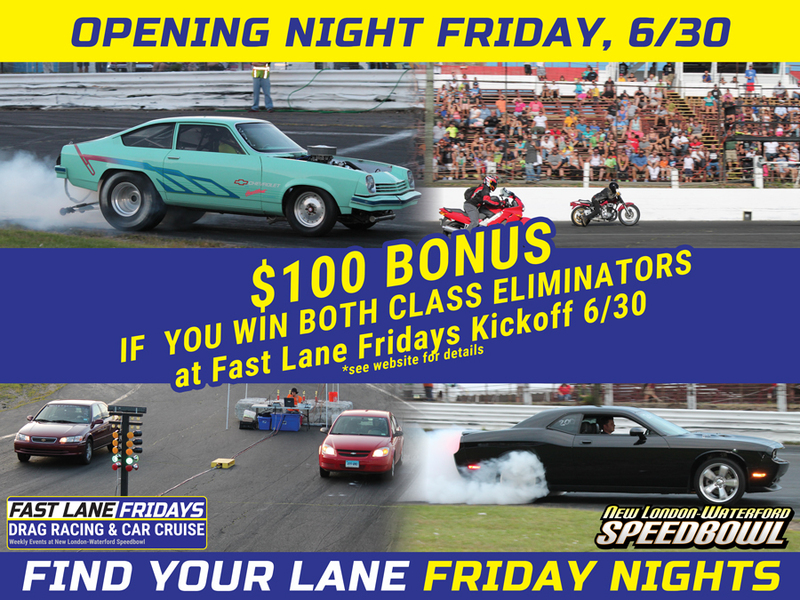 The Fast Lane Fridays Kickoff will play host to double eliminations to start the 2017 season. This means the series will run a complete set of single round eliminations for all classes and then bring all the racers back out and do another set of single round eliminations. “We got the season starting a bit later then we wanted, so to get more races in during a condensed schedule is a win for everyone” stated series promoter Mark Caise. “We are excited to get going with the season and we want to show the new management team at the Speedbowl that we have a good, strong solid program with great racer support. We want Friday, 6/30 to be packed on the track, in the stands and at the car cruise” A chance at additional races and for drivers to win up to $350 in bonus money will be on the line during the first two weeks of racing. Here is how the bonuses work: If any one driver in any of the three classes wins both of their Final Elimination Rounds on 6/30 they will pocket $100 in bonus money. 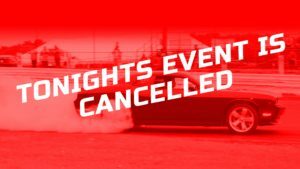 Additionally if there are 60 or more vehicles registered to race on Friday, June 30th for the opening night then the following week, Friday, July 7th will also see double eliminations added to the schedule. There will be no changes in entry fees. The bonus money will work in 2 parts, again contingent on 60 or more racers opening night. The $100 bonus doesn’t stop there; if the same driver again wins both of their final elimination rounds on 7/7 they will pocket an additional $250. A total of $350 per driver, per class will be up for grabs during the first two weeks of racing. If no one wins the $100 bonus in their class on 6/30 then that $100 bonus of two elimination wins will roll over to 7/7 for that class. Racers are encouraged to review the 2017 rule book and complete their driver registration forms in advance and bring with them on Friday, June 30th if they have not submitted already. A download is available on NEStreetOutalws.com. Gales Ferry, CT (June 15, 2017) – After months of waiting and racers eager to get back on track Friday nights, it has been announced that under new management the New London-Waterford Speedbowl will open in 2017. 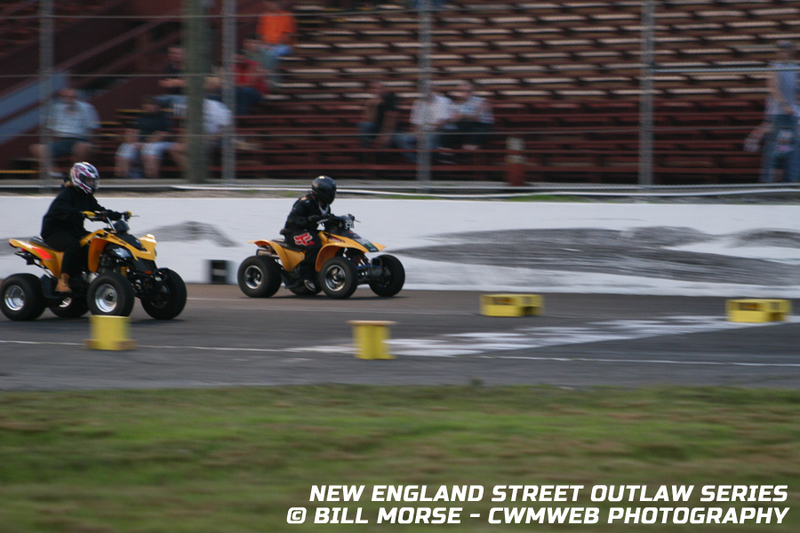 The New England Street Outlaw Series (NESOS) is pleased to announce that Fast Lane Fridays will continue at the famed shoreline oval with new season start date of Friday, June 30th. Events will run weekly thru Friday September 29th. 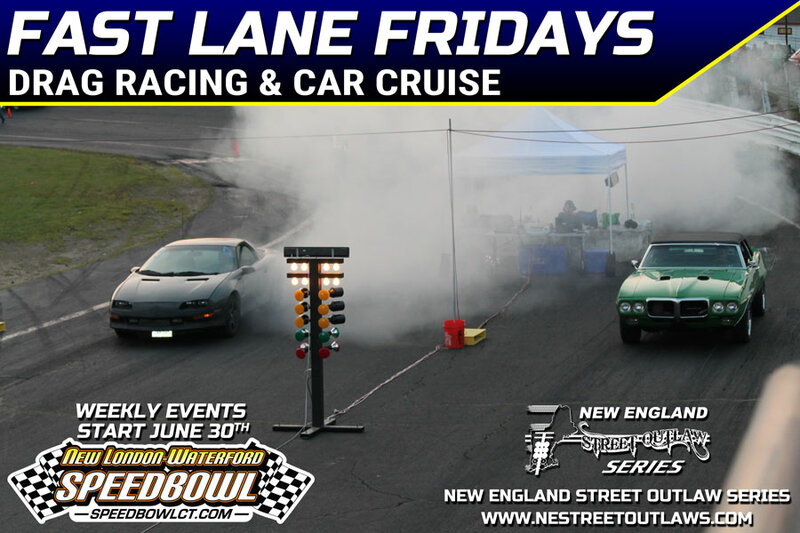 Fast Lane Fridays at the New London–Waterford Speedbowl offer the areas only car cruise paired with exciting spectator drag racing. Along with a new name will come a new attitude on these weekly Friday events with special competitions each night. Fast Lane Fridays will play host to a new special events including Double Eliminations, Imports vs. Domestics, Pro Tree Shootouts and more. In addition to the special weekly events racers will have the opportunity to compete in the Outlaw, Street and Bike divisions for a season long championship battle. Any racers with a safe vehicle are welcome to participate in the on-track action. The updated 2017 Fast Lane Fridays schedule can be found online at www.NEStreetOutlaws.com. Paired with the on-track drag racing action, fans and car enthusiasts can show off their rides in the weekly car cruise. The car cruise will be free for anyone who wishes to participate for an award and bragging rights. All of this racing action and car cruise exhibit will be FREE for fans as the New London–Waterford Speedbowl will once again be offering FREE Grandstand Admission to these events every Friday. Fast Lane Fridays will run under a lightweight rule package to ensure equal competition and allow almost all vehicles and modifications to be eligible. There will be three classes for the 2017 season. The Outlaw Class (formerly Competition / Pro) features cars that are not necessarily completely street legal. Most cars are classic muscle with performance modifications and racing slicks and others are full blown drag cars featuring full roll cages and 600+ horsepower engines. The Street Class features cars that are completely street legal. They may not necessarily be completely showroom stock; but if they can pass emission testing and not have the police need to site them a ticket for excessive noise and/or ‘non-legal components’ they are welcome to race on most DOT approved tires. The Bike Class is where it gets really interesting. This is the broadest of all the classes whether they have two wheels or four, motorcycle or dirt bike, quad, lawn mower, or snowmobile, if you can race it this is the division for you. The Fast Lane Friday events will also have a point system and will award a champion in each class at year’s end. 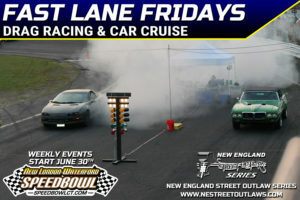 Be advised we will be postponing the start of Fast Lane Fridays at the New London-Waterford Speedbowl by a few weeks. Revised 2017 schedule will be coming soon. Thank you!! Due to unforeseen circumstances, Blast Off Weekend scheduled for May 6th and 7th has been postponed. Although much progress has been done to open for our Blast Off Event the recent findings of additional work needed on the grandstands and the unforseen weather conditions of most recent, has forced The New London Waterford Speedbowl to postpone the 2017 Blast-Off event. originally scheduled to attend to possibly find a suitable weekend to run the Blast Off event. Changes and updates to the 2017 schedule will be announced on the NLWS website & facebook page in the near future. 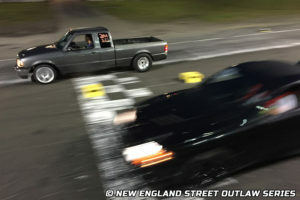 Gales Ferry, CT (February 4, 2017) – The New England Street Outlaw Series (NESOS) is poised for an exciting 2017 season of spectator drag racing events paired with a car cruise for a unique one of a kind automotive enthusiast event. 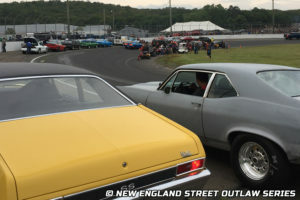 Weekly Friday night events will start May 12th at New London–Waterford Speedbowl under the newly branded name Fast Lane Fridays, Drag Racing & Car Cruise. Fast Lane Fridays at the New London–Waterford Speedbowl offer the areas only car cruise paired with exciting spectator drag racing. Along with a new name will come a new attitude on these weekly Friday events with special competitions each night. 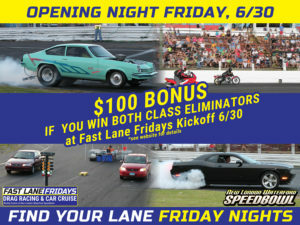 Fast Lane Fridays will play host to a new special events including Double Eliminations, Imports vs. Domestics, Pro Tree Shootouts, Street Fights and more. Fast Lane Fridays Promoter Mark Caise stated, “We are designing these events to give racers more track time and more competition than ever before with new exciting shootout style races.” In addition to the special weekly events racers will have the opportunity to compete in the Outlaw, Street and Bike divisions for a season long championship battle. Any racers with a safe vehicle are welcome to participate in the on-track action. The entire 2017 Fast Lane Fridays schedule can be found online at www.NEStreetOutlaws.com. Paired with the on-track drag racing action, fans and car enthusiasts can show off their rides in the weekly car cruise. “We are looking forward to rebuilding the car cruise segment of this event. We want Fast Lane Fridays to be a car lover’s night from racing to the midway to the parking lot. Our goal is to work with local car clubs that wish to host a night,” says Caise. The car cruise will be free for anyone who wishes to participate for an award and bragging rights. All of this racing action and car cruise exhibit will be FREE for fans as the New London–Waterford Speedbowl will once again be offering FREE Grandstand Admission to these events every Friday. The NESOS was formed with the basis of allowing competitors to race their street vehicles, drag purpose vehicles or bikes and quads in a safe and controlled environment. Some racers use the NESOS events as a way to have some fun with their friends to hold bragging rights in an exciting ‘Run What You Brung’ style atmosphere. Others use the NESOS events as a way to practice their reaction time with their vehicles before heading to larger 1/8 & 1/4 mile tracks. The dial-in system used as part of the full electronic scoring system helps to ensure drivers stay true to what their cars and themselves are capable of and allows for different style and performance vehicles to race on an equal playing field. 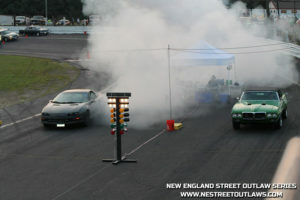 The NESOS team got its start working together in 2014 when Promoter and Series Owner Mark Caise oversaw the (New London) Waterford Speedbowl Sho & Go Program, a spectator drag racing and car cruise show rolled into one event. David Gagnon has been named the Race Director for 2017, he served in this roll previously from 2012-2014. A Fast Lane Fridays competitor meeting will be held later this month at a date and location TBD. The New London-Waterford Speedbowl opened on April 15, 1951 as a 1/3 mile crushed blue stone oval race track. After 3 weeks of operation, the dust created during green flag segments of racing became a nuisance to spectators. The track closed for about a month and re-opened as an asphalt oval, which it remains today. 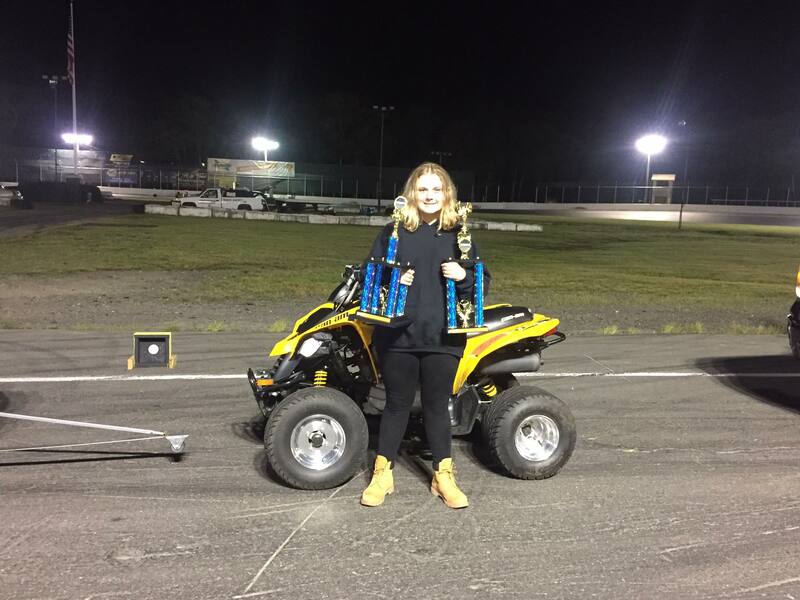 Currently the New London–Waterford Speedbowl operates 3-nights a week from May thru October with affordable Wild ‘n Wacky Wednesday action, Fast Lane Fridays Drag Racing & Car Cruise and Saturday Night NASCAR excitement. For more information visit www.SpeedbowlCT.com.